One of the biggest scientific accomplishments of the last few years was the discovery of gravitational waves by the LIGO Collaboration, which you can read about on Astrobites here. There is, of course, still plenty of work to be done in this field. For example, no experiment has definitively detected an electromagnetic counterpart (which would give off radiation somewhere in the electromagnetic spectrum) to a gravitational wave, although the Fermi Gamma-ray Burst Monitor may have seen hints of one. Detecting such a component would be scientifically interesting for many reasons. The authors of today’s paper give us two such reasons: first, LIGO currently only has a rudimentary ability to localize where in the sky gravitational waves are coming from. Identifying the specific galaxy that produced the gravitational wave would allow us to constrain certain astrophysical models. Second, we could possibly combine an electromagnetic (EM) counterpart with a sub-threshold gravitational-wave signal (one that is not statistically significant on its own) to glean more information about astrophysical events. Some models of blacks holes merging with neutron stars call for short gamma-ray bursts (GRBs; the brightest EM explosions observed anywhere in the universe) to be produced by the merger. This is the same process that produces some gravitational waves. For some of these GRBs, there is a “precursor” gamma-ray flare a few seconds before the peak of the GRB emission. This may seem like only a short amount of time, but since the black hole and neutron star are orbiting each other very rapidly, this event would occur hundreds of orbits before the merger actually occurs. The environment here includes some of the most extreme forces in the known universe, and all the particles involved are extremely relativistic (traveling close to the speed of light). Therefore, the light curve for the precursor flare that eventually reaches the observer on Earth will be affected by phenomena such as relativistic Doppler beaming and gravitational lensing. The former makes the light appear at a different luminosity than it actually is and the latter causes the light to bend on its way to us. The authors explain that all the physics combines to give off an electromagnetic “chirp”, similar to the “chirps” that gravitational waves give off. Therefore, it is conceivable that algorithms similar to those used by the LIGO collaboration could be used to search for the electromagnetic chirps. The authors used a Monte Carlo radiation transport code to calculate the light curves and the resulting spectra on Earth of a neutron-star–black-hole merger. Free parameters included the masses of the neutron star and black hole, along with the separation between them. Figure 1 shows what the thermal emission coming from the surface of the neutron star would like like over time, from the point of view of an observer looking at it edge-on (see the caption for details). They note that the inclination angle of the observer does affect their results, with the Einstein ring — a signature of gravitational lensing — only being visible at high angles. However, at smaller angles a modulation from the relativistic beaming is still present. Figure 1: An illustration showing what the neutron star/black hole system would look like to an edge-on observer at different times. 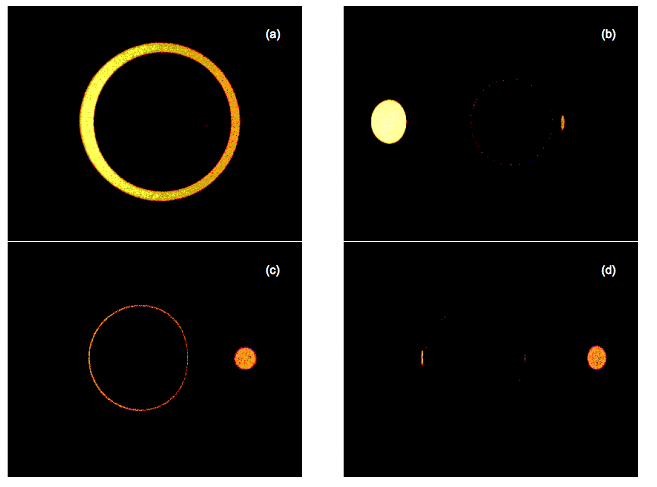 In a) the ring is caused by gravitational lensing effects; b) is the point of maximum blueshift; c) shows a weaker gravitational lensing effect; d) is the point of maximum redshift. As the system gives off gravitational radiation, the distance between the black hole and the neutron star decreases with the size of the orbit. This causes the frequency and amplitude of the light curve described above to increase, and a “chirp” — just like in the gravitational-wave signal — is observed. See the figure below for an illustration of the inspiral. The different features of the light curve (from the gravitational lensing and the beaming) dominate at different times here, and from this the black hole mass can be determined. If the light curve is precise enough, the neutron star’s radius and equation of state could even be determined. Figure 2: The electromagnetic modulation for the inspiral of a neutron star/black hole binary merger (initial separation 50 solar masses), with the zoomed in portions corresponding to the beginning and the end. The authors do note that the luminosity range in which the EM “chirp” could be detected using satellites such as Fermi GBM is fairly small: if it is too bright, a fireball will occur that would mask the chirp. They end the paper by observing that there are still chirps that could be detected with current technologies, and that future gravitational-wave observatories such as LISA could potentially work as a trigger for electromagnetic experiments to target their observations.